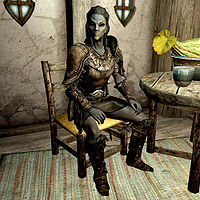 Jenassa is a Dunmer ranger who can be found at a table at the Drunken Huntsman shop in Whiterun. Should you choose to pay her fee, Jenassa is available as a follower for 500 gold. As a ranger, Jenassa favors the use of bows, but will enter melee should the situation necessitate, and is also one of the few followers able to dual wield weapons. Jenassa wears a set of leather armor with matching pairs of bracers and boots. She is equipped with an iron sword, an iron dagger, and a hunting bow supplemented with iron arrows. She has a general dislike of mines, saying they do not agree with her, and comments on how she prefers being above ground. She also dislikes the fact that the poor do the mining, but only the rich can afford what is found. She responds to being healed by Restoration spells rather ungratefully, saying "I hope you're not expecting a thank you." She periodically makes comments about preferring to sneak up on her targets. She also makes several comments about the Dwemer, regarding them as the size of an average human. It is possible for Jenassa to become a member of the Blades. She also becomes a potential candidate for marriage after being hired by you. In the Creation Kit data, there's an outfit named 'JenassaOutfit', which consists of a leveled piece of light armor boots, cuirass, and gauntlets of the best quality. However, it isn't in use. If you hire her and enter Jorrvaskr, she may disappear. If this happens, check the Dragonsreach Dungeon. If dismissed, she may not return to her home but still follow you around. Sometimes Jenassa may disappear from the Drunken Huntsman and will instead be found standing stationary a short way off the main road just west of Broken Fang Cave. Hiring her as a follower then dismissing her will cause her to walk back to her normal location at the Drunken Huntsman. There are no audio dialogues for the selling menu, which means if you get married with Jenassa and open the "What have you got for sale?" dialogue, it shows only dialogue subtitles without speaking for only half a second and then selling menu will be shown. ? Every once in a while Jenassa may not be able to wear Ebony armor, Other heavy armors work, It is just Ebony that doesn't. ? This page was last modified on 13 December 2017, at 02:41.